Today’s CultureTrav interview is with Ann Davis, founder of Venture with Impact. Share a bit about yourself. What inspired the launch of Venture with Impact? Shortly after the New Year in January of 2013, I had returned from a much-needed winter vacation. I was working as a teacher in what had recently been a failing school, educating some of the most at-risk youth in the country. A year earlier, I had been accepted into the Teach For America program, a prestigious organization that trains green college graduates to teach some of the lowest-performing public schools in the country, with the ambitious mission of closing the achievement gap. There were many times that year when I wanted to quit, however after returning from my holiday break that January, I was determined to work as hard as I could for my students and myself no matter the personal sacrifice. A few weeks into the New Year, I took a run with some friends on a Sunday afternoon. Although it was winter in New Orleans, Louisiana, the sun thought it was the beginning of June. The only indicator that it was mid-January were the Mardi Gras wreaths hung throughout the neighborhood. I had experienced a wake-up call. Without this mind-boggling life event, I would probably never have had the guts to quit my full-time job, and follow my dream. After my recovery, I moved to NYC and continued to teach, but my health and work-life were my number one priorities. I began traveling every chance I had – the count is now over 40 countries in 5 continents. Then, in July of 2016, I took a leap when I left my teaching career and moved to Perú prepared to launch my nomadic lifestyle. During my time working in the United States, I noticed that my friends and colleagues struggled between the desire to maintain careers that provide financial security, and the desire to travel and work for the social good. My co-founder and I started Venture with Impact because we, like many professionals, were torn between the desire to travel and make a social impact, while at the same time, maintaining a professional career. How does Venture with Impact work? Why do you think it’s important for travelers to give back to local communities through skills-based volunteer projects? Venture with Impact allows professionals to live for one month in a destination abroad, work remotely for their job back home, and volunteer on a pro-bono project with a local organization. We match each Venturer with a customized skills-based volunteer opportunity. The matching is based on the needs of our organizations as well as the skills and interests of each participant. They have the opportunity to develop professionally while making an impact locally. 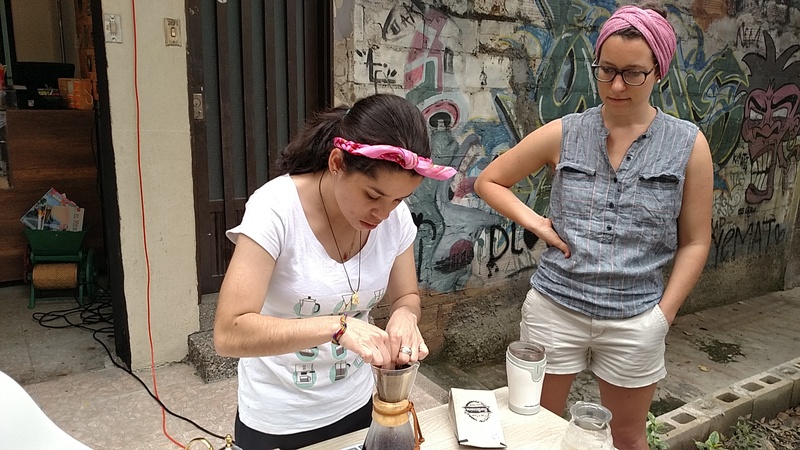 – A case study from former participant Rina Obi detailing her experience in our Medellin program. A blog article from Lisbon Venture alumna, Joanne Gerber. Here is also a video about our skills-based volunteering. My co-founder and I started Venture with Impact because we both worked in international development, and noticed the lack of resources available for non-profit organizations world-wide. This is true for both financial resources, but also in terms of professional consulting and assistance. We work closely with our local partner organizations to understand their needs from month to month. You offer programs in various locations including Colombia and Thailand among others. What makes each experience unique? Each of our one-month programs have similarities in that they include a cultural orientation, language crash course, city tour, day trip, and weekly meetups. We also plan a number of cultural events and activities that are unique to each location such as salsa dancing with an award-winning dance instructor in Colombia, a tile-making workshop with a local ceramist in Portugal, and a visit to ancient pyramids in Mexico. Additionally, the relationships built between our Venturers and our local organizations in each city provide for a very unique experience. How do you work with employers to create retreats for their employees, and how do you incorporate a focus on cultural immersion? Companies and organizations will send their employees to participate in our one-month programs, as a professional development opportunity, as well as a perk or benefit. We provide personalization for each individual, with a carefully-sourced skills-based match to one of our local partner non-profits. Each employee shares the skills that they would like to hone and develop, and this is integrated into their partner project. Our custom short retreats (3-10 days) are similar in that they are designed to meet the needs of the company, including team-building activities, professional development workshops, etc. The short retreats include an Action Workshop, in which the company group works with a local non-profit to identify a problem and brainstorm solutions together. Additionally, Venturers participate in a number of local cultural activities, many of which are with our local partners. For example, in Lisbon we engage in a Portuguese cooking workshop with a local organization that provides culinary and hospitality training to immigrants and refugees. When it comes to your own personal travels, how do you think exploring the local culture of a destination–and doing meaningful volunteering– helps you discover the local “story”? I have spent a great deal of time with local people, learning the language, and participating in community activities. In Medellin, I have experienced first-hand the generosity and light-heartedness of Colombians. I also have a deeper understanding of how their difficult history has played a part in their resilient character. Through my relationships with Northern Thai people, I have greater knowledge of the issues relating to tribal populations and refugees, that have long existed in this part of the country. The stories of individual people are what make up the history and culture of a place, and working with non-profits and locals has allowed me the opportunity to listen. What was a particularly memorable trip you’ve been on? Why was it special? You’re going to make me choose?! What a difficult question. I’ll share a funny travel story, that was quite memorable. During one of our first Venture with Impact programs in Trujillo, Peru, we took a weekend trip to Huaraz, an incredible outdoor destination in the Andes. To arrive from the coast, we took a 6-hour bus climbing to our destination, over 10,000 feet above sea level. On the second day, I was to accompany our 14 Venturers on a hike in the beautiful Huascaran National Park. Everyone was psyched! I went to bed that night feeling great and excited for the morning. I woke up in the middle of the night to use the loo, and the next thing I knew, I was face down on the floor with my pants down, and a golf ball sized lump on my forehead! It turns out, I am quite sensitive to altitude, and I had fainted right off the side of the toilet! The next day, I decided to stay back as the group Venturered off on their hike with a local guide. Luckily, I had visited the unique turquoise lagunas of Huascaran in the past, and the group had a great time without me! I’d tell them what I tell myself everyday: take risks, be positive and optimistic, don’t be afraid to ask for help, and use your network. Don’t hesitate to tell people about your idea and spread the word. We are so afraid of failure and what others think. Most people don’t spend time thinking about what that you failed at, but if you succeed, it’s something that they notice. Read more about Venture with Impact on the website, and follow the adventures on Facebook, Twitter and Instagram.